A country that builds some of the crummiest cars in the world and needs outside help in all engineering projects since WW2 when most of their engineers emigrated to less hostile nations, should get that help to take care of this hazardous atoll problem. I can understand why Renault cannot sell their cars in Australia nor any other French brand, we are also suffering from the fall out. We have not forgotten Mururoa Atoll. And now we might get hit by a French nuclear tsunami. I feel sorry for the pacific islands, they got screwed by the Frogs. Didn't happen to read any suggested solution for the problem. Did I read the article too fast? Noted. Anyone looking for signs of intelligent life in the universe should bypass this planet. Thanks Judy for the link to the Epoch Times article by Raiatea Tahana-Reese. The results of a collapse is scary to think about. Read and noted. This is frightening and shocking. Crazy. Were these military scientist very counsious of what they've done? Every life form on Earth now has radiation from all of the testing underground, above ground, undersea...., Chernobal, Fukushima, other plants, Los Alamos projects, etc etc etc! We all carry these traces within! When will we stop using radioactive materials entirely? We have no place to put the waste, no way to provide power to keep these plants cool for more than a short time, and yet, the radiation lives on for thousands and millions of years. Are they doing anything to remove what waste they can now? Nuclear waste has always been very bad news and burying it inside containers buried in the ground is no solution. we shouldn't be creating it in the first place, and we all know it. If Mururoa Atoll does collapse and radioactivity escapes into the Pacific Ocean, I shudder to think of the consequences, they are horrific. No nuclear nation comes out of the testing era with any credit. 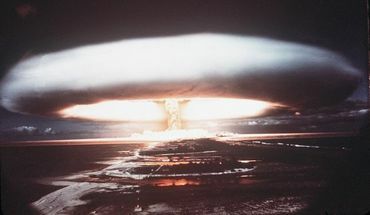 Bikini, Eniwetak, Novaya Zemlya, Christmas Island, Maralinga, Lop Nor, and all the others, are parts of this good earth which will remain poisoned and scorched when the makers of these infernal devices have been long forgotten - until a time beyond the span of our species. And what have we gained from this new knowledge? Anyone? The French government's arrogance is beyond understanding. The country that gave us the Cousteaus!!! Holland had better wake up, big time. Brain dead is a good description of their politicians and contributing scientists. Corrupt also describes it. Let them soak their brains in their bides and finally get on the side of the environmental movement. By the way, their wines are way over priced for their quality. Stick to New World, much better value. Halle Barry running to Paris from the paparazzi, please, Diana died there. Sorry, I forgot to mention the French killing Greenpeace activists way back then. They have a lot to answer for.